Home » Posts Tagged "fiberglass"
The Double Ended Cubix Bath from Claygate Distribution Ltd is a stunning new bath with contemporary looks and eco-friendly credentials to add to their Artisan range of luxury bathroom products. The Baths are manufactured using a technically advanced laminating process called Corincast, which makes a solid, super-strong acrylic product. Extra layers of fiberglass and reinforced polyester resin are added during production, giving the bath superior torsional rigidity. The last layer seals the shell and makes the underside of the bath smoother and easier to handle. This cutting edge design combined with the newly developed Corincast technology means that the baths use 25% less water than comparable baths while the extra layers of fiberglass gives greater insulation, resulting in the bath water keeping its temperature for longer. 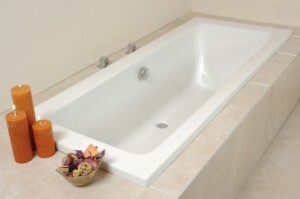 The Cubix bath is available in two styles with a choice of double ended baths that come in five sizes and single-ended baths that come in three sizes. All baths can be drilled on site to suit your chosen tap configuration. Available sizes are 1700 x 700, 750 or 800mm or 1800 x 800 or 1000mm. RRP £280.00 (1700 x 700mm) up to £480.00 (800 x 1000mm).